The two Simplicity patterns shown here date from Spring, 1972 and include textile swatches suggested for each pattern style. Simplicity 9725 was part of a young looking group called "Young Contemporary Fashion". It included styles that seemed to be currently selling in the market for juniors. Fabric suggestions include 50% polyester/50% rayon blend wovens in a sheer leno stripe weave. The midriff waistline with flutter sleeves was influenced by the vintage 1930's styles popular at that time. Simplicity 9709 is a bit more mature, from the "Designer Fashion" collection (no name mentioned in this promotional group). It was suggested for patio parties and proms. The black bodice shows up often during this era, worn over bright abstract or floral patterns. The fabrics shown here are 75% acetate/25% nylon in a textured 'terry cloth' texture on a velour knit. Bright solids are paired with very graphic prints inspired by Pucci and patchwork quilts. Another great fashion illustration by "Eric" (Carl Erickson) who was a strong graphic influence from the 1930's through 1950's for the American "Vogue" magazine. There is a mention of Carl Erickson this month in "Vogue" along with a small glimpse of him in a fashion photo of Gertrude Stein by Horst (see February, 2012, page 112). This Asian inspired coat is a very early example of the direction that Bonnie Cashin would explore in the decades to come: simple "T" shaped coat with narrow mandarin collar. Here she uses linen and embellishes it with frog closures in a design for Adler and Adler. Later those frogs would become her signature brass twist locks. "Sawed-off Chinese coolie coat--new length: white Irish linen, frog closings: three-quarter length sleeves. A summer coat with more than one life to share. First and foremost, a life with a bathing suit; then, perhaps, over a slender skirt in town, slacks at home. Coat by Bonnie Cashin, $30, At Lord & Taylor; Garfinckel's; Neiman-Marcus." 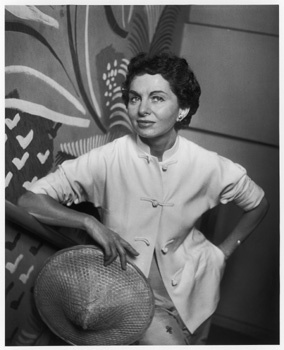 This photo of Bonnie Cashin shows her wearing the same coat, worn casually with pushed up sleeves (a style she favored). Eric was an American fashion illustrator during the 1930's through mid-1950's. His full name was Carl Erickson (1891 - 1958). He is best known for his full color "Vogue" editorials, that he created during the more than 35 years that he contributed to the magazine. Eric's style included a sensitive line often created with black brush strokes or charcoal made on rough paper. His portraits of famous clients included Gertrude Stein, Queen Elizabeth and President Roosevelt. He worked from live models, rather than photos. Most of this time he lived in Paris, the fashion center during those decades. This illustration was cropped and removed from the original magazine issue, so the date is general: about 1938. These adorable illustrations come from the late 1930's, artist unknown. There is such a sweet Victorian revival style to the look. Victorian influences were wildly popular during the late 1930's and into the 1940's. The classic 1939 movie "The Women" with designs by Gilbert Adrian is a great way to see these quirky little hats in action. The three fashion illustrations here are editorial drawings from the June 1950 issue of "Vogue" magazine painted by Count Rene Bouet-Willaumez (RBW). He was a top fashion illustrator from the pre-WWII era, along with Carl Erickson, better known as "Eric", Christian Berard and Rene Bouche. Having built a strong reputation during the 1930's, RBW would continue to provide drawings for Vogue and Bazaar into the early 1950's. His loose, Asian inspired brush work illustation style was part of the "Expressionist" movement. He was proficient in creating a dynamic illustration using black india ink on rough cotton paper. The 1950's would mark the end of fashion illustration editorials in glossy fashion magazines. Photography moved quickly into the dominant editorial position. Drawing from a live model wearing the dress, his technique can be seen in the use of a wet paper to flow on the gray shaded areas. When that had dried, he painted the illustration, probably using a tapered asian paint brush or similar shaped water color brush dipped in deep black india ink. The textured areas are 'dry brush' painted with a brush that has had the ink pressed out, so the brush is damp. This style had a sensitive line that was popular through out the magazine and newspaper industry during this era. Forty years ago, Simplicity pattern company produced a guide to Spring 1972 teen fashions along with textiles suitable for each pattern. This first pattern (Simplicity 9650) features a safari outfit, with shorts or flare leg pants. Style suggestions include adding a 'rugged leather belt', neck scarf or hat. Colorful denim is advised for sewing this outfit. These swatches are 50% Kodel polyester / 50% cotton in 44-45" widths. Popular colors are simple primaries: red, light blue and classic denim blue. Naturals in brown with a coordinate stripe offer an alternative to the brights. These illustrations were produced for Spring 1972 in a large format portfolio of pattern pages opposite the swatch pages. The portfolio is titled "Teen Fashion Environment" and was produced by the W.T. Grant company, a discount chain store that carried fabric and sewing patterns in small towns across the U.S.
Surrealistic fashion illustration, from about 1938, signed by Wilena.